We started some new runs today. These will involve new star files. Please be patient as the new star files are distributed. Message 57691 - Posted: 28 Mar 2013, 18:28:05 UTC - in response to Message 57690. Are these WUs much longer than the previous ones? 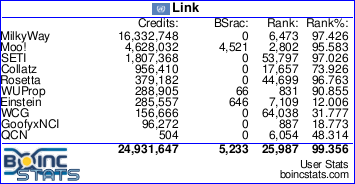 I'm asking because my BOINC client decided to switch to panic mode immediately after it got one of them. I have got some of them and the estimate run time is 87600 hours !!!! even CPDN tasks dont take that long. Message 57693 - Posted: 28 Mar 2013, 18:55:51 UTC - in response to Message 57692. I also have only task which errored out after a one second or less. Yep, there's something wrong with those. Estimated runtime 87600 hours and error out instantly. Interesting thing: one of my wingmen was doing such WU on ARM and could complete it in 20 seconds. The std_err output however does not look healthy. Hi, has 3 incorrect tasks with the same error. I pulled these runs down. I think I know what the issue is - the step sizes in the volume integral were set too small, which ironically causes the server to freak out because of a fix that was implemented due to some big step sizes that made the server freak out. We should have them repaired and back up later tonight. Message 57699 - Posted: 28 Mar 2013, 22:12:21 UTC - in response to Message 57697. I have started new runs with larger step counts I am creating a new thread for these runs. Message 59128 - Posted: 26 Jun 2013, 23:35:08 UTC - in response to Message 57690. I'm getting the error that they were getting back in March now in June. its cut off after the S on that one. its cut off after that. I searched my system and I do not have a file called Ktm32.dll. and it cuts off after that. I searched and I dont have a file called astronomy_parameters.txt. I've gotten several of each type error recently. Should I be fixing something? Series Mainframe in 1975 at age 12. Message 59141 - Posted: 27 Jun 2013, 20:11:47 UTC - in response to Message 59128. Since you have no errors or invalids in your results, I'd say no. Missing astronomy_parameters.txt is completely normal, the others does not look "dangerous". I mean, it runs, that's good enough. Message 59158 - Posted: 28 Jun 2013, 20:41:10 UTC - in response to Message 59141.